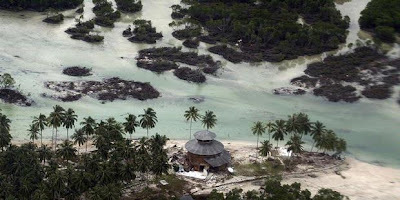 Hundreds of people become victims of the tsunami that swept the Mentawai Islands region recently. Residents who are victims generally fail to save themselves or even do not get early warning of the arrival of the giant waves according to the analysis, the high expected to reach 14 meters. However, there is a hamlet in the Mentawai which turned out to all its citizens safe from disaster. Indeed, not many residents of the village. There are only seven houses there. However, the success of all the villagers to save themselves should be a study to deal with the threat of tsunamis in the future. "Residents in the hamlet of South Pagai Limosoa in the region entirely safe even though the houses were all destroyed. There were no fatalities in the village," said Dr. Danny Hilman, geologists from the Indonesian Institute of Sciences (LIPI) in a press conference held in Building Council Consideration of the President, on Friday (19/11/2010). Danny said that education about earthquakes and their potential spread is very important in society. The residents are safe thanks to the understanding of earthquakes. In the village, there was a good transfer of knowledge between the children and the elderly. Children who have good understanding of the earthquake from the school notify the parents. "Parents know about the earthquake instead of her children. In the meantime, his own children to get education from the school," said Hilman. Thus, when an earthquake is felt, the whole population to rush to escape to higher ground in anticipation of a tsunami. What happened in this village, according to Danny, could be a good example for other regions. From this experience, he said that education about the earthquake and tsunami has become paramount. Good understanding of the earthquake and tsunami capable of rescuing people from disasters.